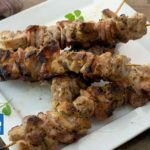 Big fans of "Bacon" here so we thought we'd go ahead and make some tasty Chicken & Bacon Kebabs Keto Style! We don't use any sugary marinates and season with Delicious Garlic & Oregano. Make these Keto kebabs ahead of time and take them out to the BBQ. Cut the chicken thigh into 3-inch x 1-inch strips. Cut the bacon into 3-inch x 1-inch strips. Thread the chicken and bacon onto the skewers alternating thread each piece of meat doubled over (you should pierce each piece twice). You should end up with 4 large kebabs but you could make 6 smaller ones (we made 4 kebabs). Spray the kebabs liberally with coconut oil spray (olive or peanut if you don't have it but coconut is best). Dust each chicken and bacon kebab with garlic powder, dried oregano and salt. Place on a hot grill turning often, until the chicken is cooked through.